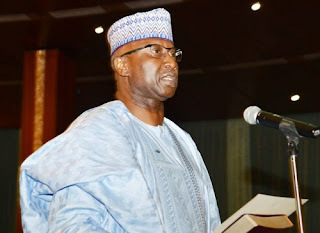 POLITICS – Latest update as the Secretary to the Government of the Federation, Mr. Boss Mustapha, on Saturday promised to conduct himself creditably in office. According to a statement by the Director of Press, Office of the SGF, Lawrence Ojabo, the SGF spoke at a reception organised in his honour by the Hoba Elders Council and Hoba Community in Abuja. He said he would work hard to ensure that at the end of his service, his people would be proud of him. “The SGF pledged that he would conduct himself creditably in office that at the end of the day they would be very proud of him,” the statement read. Mustapha thanked the dignitaries, traditional rulers, elders and the entire community for organising the reception in his honour. He acknowledged the individual and collective roles and contributions of some of the dignitaries to his political career, beginning with his nomination into the constituent assembly. He thanked the community for nurturing him and propelling his growth and development and other young people to become useful members of the society. The SGF implored them to continue to foster their traditional values of formidable unity, love, mutual care and responsibility for all their families and children. He recalled that all his life, he had lived and pursued his political activities from Yola North, and not Hong. He said he was therefore particularly elated that the Hong community could have arranged such a reception for him . He prayed that God Almighty would cause something to happen in their lives because of their investment in his life.